It’s a simple truth – we are all insanely busy these days. Work, children, social commitments, there just doesn’t seem like there is time for everything. The first thing that usually gets put on the backburner is spending quality time with your significant other without the children. Yep – “date nights”, “mommy/daddy time”, whatever you want to call it, it is something that quickly gets forgotten when life is operating at full speed. Sitting on the couch watching a movie after the kids go to bed doesn’t really cut it. That is great to do, and can definitely go a long way with getting some quality time fix; but we are talking putting on makeup, or shaving, making plans, and leaving the house kind of date night here. Believe it or not, the concept of “dating” isn’t just for single people, or teenagers. Dating during a marriage is crucial for strengthening your partnership. Many people are put off by the idea of a date night because they believe it needs to be something fancy, or incredibly planned out. Although roses and a violinist wouldn’t be a bad thing, it doesn’t need to be that way. It could be as simple as heading to the local bowling alley for some time away. The most important thing for couples is getting some “us” time without all of the normal stresses weighing you down. What is the easiest way to make this happen when you are busy being a parent 24/7, 365 days a year? Find yourself a trusted sitter who can come watch your kids while you and your significant other take a much needed and deserved break. 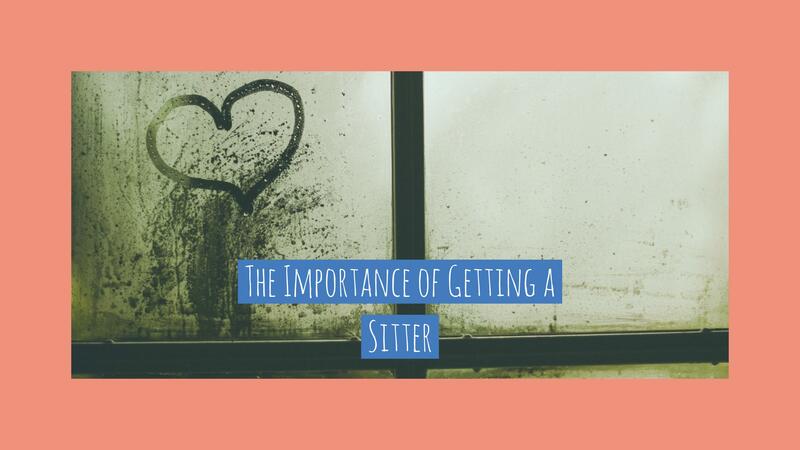 There are many benefits to getting a sitter other than just the fact that you are getting a break, so don’t ever feel guilty about scheduling a sitter on a regular basis. Believe it or not, it is really healthy for your children to be exposed to additional authority figures other than yourself. It will help teach them independence, it will help them respect you, as well as others more, and ultimately will make them better people. Sitters can also be positive influencers, teachers and motivators to children. It is actually a treat for children to spend time with a different adult – sitters can teach them new games, activities, etc. Think about it, there is a pretty good chance that your sitter is closer in age to your children than to you – they have a lot to offer and can probably relate better to certain things than us parents can. We have a sitter, now what? Just doing dinner and a movie can get monotonous & may not put you into a situation where you can truly interact and talk. Try a new activity like an indoor rock climbing wall, go wine tasting at a local wine shop, play a round of miniature golf, take a cooking class. Anything that has the elements of variety and fun to you would work well. If you want to go out for a dinner, try something out of your norm. Try a new restaurant in your area, or better yet, travel outside of your typical comfort zone and try something completely different. Mix it up, variety is the spice of life! Maybe just getting in the car, throwing on some of your favorite music and going for a drive can be relaxing – even if you don’t have a specific destination in mind. Maybe try a couples massage, or other type of spa service. Everybody has their own version of relaxation – what some people find being an adventure or physical exertion, can actually be relaxing to others. Go find your zen! This really is up to you, after all, everyone has different schedules, difficulties finding sitters, financial considerations, etc. If you can swing it, try to make it a regular, standing occurrence. Make it a new tradition – doesn’t always have to be planned, spontaneity is always great to mix in, but try to make this a staple in your relationship. Getting a babysitter should be fun for both you, and your children – especially when both you and the sitter are comfortable with the children and the routines. It really is a win-win for everyone involved – try to do it more often. You will thank yourself in the long run.